Notice! Aydınbey Gold Dreams hotel does not accept reservations at this time. Please try again later. Aydınbey Gold Dreams hotel Contact. Aydınbey Gold Dreams Hotel is located on a 16,000 m2; area, with several playgrounds, 2 different À la Carte Restaurants and unlimited activities to choose from for family fun. We are confident that we can accomodate a dream vacation for any guest..
Aydınbey Gold Dreams hotel accepts VISA and reserves the right to temporarily hold an amount prior to arrival. Aydınbey Gold Dreams hotel accepts Master Card and reserves the right to temporarily hold an amount prior to arrival. Aydınbey Gold Dreams hotel accepts Maestro and reserves the right to temporarily hold an amount prior to arrival. Aydınbey Gold Dreams hotel accepts Bank card and reserves the right to temporarily hold an amount prior to arrival. Aydınbey Gold Dreams hotel accepts ATM card and reserves the right to temporarily hold an amount prior to arrival. Free buffet meals in the morning, lunch and dinner. Some national and international alcoholic and non-alcoholic beverages are free between 10.00-02.00 hours according to the brands determined by the facility. The minibar is filled with water and soda at the entrance, the other days are only renewed with water. In a weekly stay, 1 a la carte restaurant, 1 free. A la carte restaurants serve from 01.06-15.09. The entrance to the rooms of Aydınbey Gold Dreams Hotel starts from 14:00 hours. The departure time from the rooms is no later than 12.00. Tesise pet is not accepted. The use of outdoor open spaces is subject to seasonal conditions. There are rooms for the handicapped. 2 + 2 or 3 + 1 accomodations in rooms other than family rooms or some private rooms may cause congestion in the room and the extra beds provided may not be comfortable with the fixed bed. 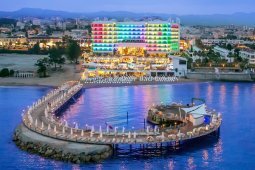 Ultra All Inclusive accommodation on premises starts with an evening meal, includes dinner until the number of nights stayed and ends with breakfast on the morning of departure. Terrible hotel at all. Music noisy, No Air Conditioning in Hall and other ambient. Quantitative foods, but no Qualitative. No Sea food. Restaurant like a prison. You will gather all foods and plates one by one, miss the tray. So the Restaurant was very messed and noisy one. Ridiculous. Long line for food , like the Prison. Staff was unhelpful and unfriendly. English language was a barrier. Reception was amateur. The post of Clients' relation was poor, any assistance, but only angry. The Bar staff was so unfriendly and no English. The staff was mistreated by Management. Small rooms. To clean the rooms, need to pay extra money. 5 Euros for few iodine, when I hurt in stone of beach. The service of baths, downstairs was terrible. That Hotel was in line to Russian People or Caucasian one. No Europe at all. And for irony, in front of that so called 5 stars Hotel , was Haydar Pasha palace, a brilliant Hotel, that was also with 5 stars. How strange is this World! Отель на 4 с минусом. Питание хорошее, но очередь выстраиваится еще за 30 минут до открытия ресторана, будто всем не хватит) еды полно, на обеде больше всего людей и не всем хватает столов. Анимация хорошо работает, людям весело. Убирают все время, чисто всё. - не только в номере. Пляж собственный яерез дорогу. Полотенца есть в отеле, получать бесплатно по карточкам.